Bulkeley Wing in Market Drayton, Shropshire sleeps 10 people. Built in 1720 by Bulkeley Mackworth, and set in a prominent location within 18 acres of parkland, the apartment [right in photograph] of this Queen Anne mansion has been restored with character and style. With views to the Welsh hills over open countryside, the accommodation offered is of a very high standard, with comfort and all modern conveniences. An enormous games room with a full-sized snooker table, table tennis and darts allows for friendly competition in front of a roaring fire. Within the grounds lies a lake, with coarse fishing available by prior arrangement, whilst guests have use of their own secluded courtyard area. Home of the gingerbread, the attractive town of Market Drayton was once famed for its Damson Fairs, and many Draytonarians continue the tradition with damson feasts each autumn. Keen walkers can follow the trails of the famous Clive of India or the unusual bloodthirsty ‘Murder and Mayhem’ track, whilst a wild animal trail offers a rather more sedate option for the children! Market Drayton is the ideal base for touring Stoke and the Potteries, Ironbridge, Shrewsbury and North Wales. The Shropshire union canal winds it way close to the town, its tow paths, flights of locks and breathtaking aqueduct well worth a visit. 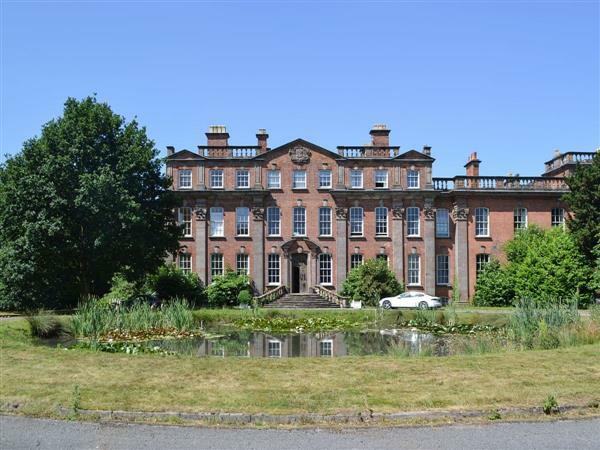 Nearby you can find award-winning gardens, such as Hodnet, Wollerton Old Hall and Hawkstone Park, with its golf course and unique landscape of caves, woodland and follies. Pubs and shops 2 miles. Spiral staircase to first floor: Large living room with open fire. Spacious modern fitted kitchen with dining area. Three double bedrooms, one with en-suite bathroom/W.C. with shower attachment, one with en-suite shower room/W.C. with high pressure shower, and one with W.C. with wash basin. Two twin-bedded rooms with an interconnecting door (and each with a separate entrance from corridor), each with en-suite bathroom/W.C. with shower attachments. For a better idea of where Bulkeley Wing is, you can see Bulkeley Wing on the map below. Bulkeley Wing is in Shropshire; should you be on the lookout for a special offer, you can find all the special offers in Shropshire. It's always worth checking to see what is on offer at the moment. Do you want to holiday near Bulkeley Wing (RD8), you can see other cottages within 25 miles of Bulkeley Wing; have a look to find your perfect holiday location.